On Dec. 9, APTA President & CEO Michael Melaniphy and APTA's government affairs staff had the opportunity to thank congressional leaders for passage of the FAST Act. Celebratory Capitol Hill receptions brought together Senate Environment and Public Works Committee Chairman James Inhofe (R-OK) and Ranking Member Barbara Boxer (D-CA), Senate Commerce Committee Chairman John Thune (R-SD) and Ranking Member Bill Nelson (D-FL), House Transportation and Infrastructure Committee Chairman Bill Shuster (R-PA) and Ranking Member Peter DeFazio (D-OR), as well as many key congressional staff and industry leaders who helped secure the fully-funded, five-year bill. APTA was proud to be an important part of such an historic milestone in public transportation history. For APTA's summary of the FAST Act's provisions and funding, click here. To view a video message about the FAST Act from APTA Chair Valarie J. McCall and Melaniphy, click here. FTA has launched a nationwide transit-oriented development (TOD) program to encourage development near public transit systems. The National Public Transportation Transit-Oriented Development Technical Assistance Initiative provides state and local leaders with ideas and resources to promote TOD. The goal is to help grow local economies by making jobs and services more easily accessible in mixed-use, walkable communities. FTA developed the program in partnership with Smart Growth America (SGA), a national organization dedicated to bringing smart growth practices to more communities. Along with disseminating best practices and profiles of communities that have successfully implemented TOD, SGA will work on site with leaders in several communities to offer technical assistance tailored to local needs. The free technical assistance, which will be offered through a competitive process, will include planning for and managing economic development near transit through effective zoning and land use as well as expert advice on preserving affordable housing and securing advantageous commercial development, among other issues. Community leaders can apply for technical assistance by clicking here. The initiative is part of the Ladders of Opportunity Initiative announced by President Obama and DOT Secretary Anthony Foxx. The Washington DC Chapter of WTS (Women's Transportation Seminar) honored FTA Acting Administrator Therese McMillan on Dec. 9, naming her 2015 Woman of the Year. For more than 35 years, WTS has provided opportunities for transportation professionals to grow their careers. Members include planners, engineers, landscape architects, policymakers, government leaders and other professionals committed to WTS's mission of transforming the transportation industry through the advancement of women. 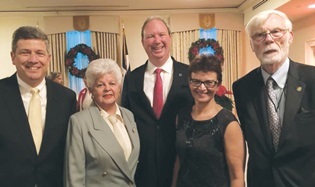 L to R: John D. Porcari, Senior Vice President, WSP | Parsons Brinckerhoff; U.S. Rep. Grace F. Napolitano (D-CA); Melaniphy; McMillan; and Mortimer L. Downey III, President, Mort Downey Consulting. The U.S. Departments of Transportation, Education and Labor will hold an online national forum on transportation careers and skills training on Dec. 16, 1:00 - 2:30 p.m. Participants will discuss strategies to align skills development with transportation job demand. There also will be an opportunity to learn about new tools and resources that can help advance transportation careers at the state and local levels. Representatives from the transportation industry, workforce boards, job centers, community colleges and apprenticeship and technical education programs are encouraged to join this virtual event. The 5th annual TransportationCamp in the Washington, DC, area is scheduled for Jan. 9 at George Mason University's Arlington, VA, campus. The event takes place on the Saturday before the National Academy of Sciences' Transportation Research Board Annual Meeting and is expected to attract more than 400 industry thought leaders, young professionals and students from across the nation. All of the sessions are created by the participants, which encourages an open exchange of ideas in a high-energy environment. Topics include shared-use mobility, innovative technologies, integration of transportation and the environment and many other timely issues. > Business Member Board of Governors (BMBG) Annual Business Meeting is Jan. 19 - 22 in Kahuku, HI. For program information and registration, please click here. > Transit CEOs Seminar is Jan. 30 - Feb. 2 in Orlando, FL. “After 36 extensions, hundreds of Congressional meetings, two bus tours, visits to 43 states, and so much uncertainty, it has been a long and bumpy ride to a long-term transportation bill. It’s not perfect, and there is still more left to do, but it reflects a bipartisan compromise I always knew was possible."